Who is it for? 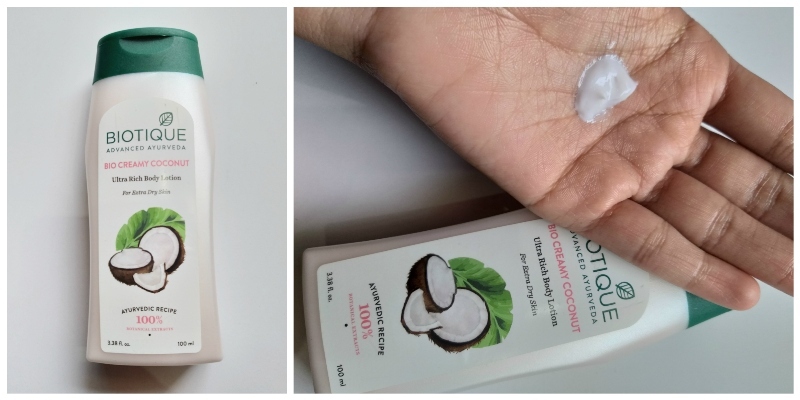 Biotique Bio Creamy Coconut Body Lotion is for dry skin that provides heavy moisturization all day long. Massage into damp body skin until absorbed completely. This moisturizer comes in a pearl white plastic bottle with a flip open cap. The packaging could, however, be improved. It is milky white in color. The consistency is neither too thick nor too thin. It is really creamy in texture and feels very soft. The fragrance is mild and really good. It smells like other biotique moisturizers. This is a really good moisturizer for dry skin. I had really dry skin but this moisturizer repaired my skin. It provides heavy moisturization all day long without feeling sticky. You do not need to reapply this which is a really good thing. It feels very light on the skin and gets absorbed quickly. I would have liked it if the packaging would have been a little more convenient and came with a pump instead of a flip open cap. Since it comes from an ayurvedic brand it is free from harmful chemicals. Quickly gets absorbed into the skin. Do not need to reapply it. If you have dry skin you should definitely try this, it works really well. I am looking forward to repurchasing this once it gets over.